GOLDERS GREEN is a large residential area about five miles north of London, in the municipal borough of Hendon. The Crematorium is situated on the northern border of Hampstead Heath, the entrance being in Hoop Lane leading off Finchley Road on the northern side of Golders Green Underground station. It is only since the beginning of the 20th century that the ancient custom of cremation instead of burial has been followed to any extent in the United Kingdom, and soon after the turn of the century the Cremation Society of England felt the need for the establishment of a crematorium in the vicinity of London to serve the requirements of the Metropolis. The London Cremation Company Limited was formed for this purpose, and the Crematorium was opened in 1902. Men and women who died in the service of their country during both world wars were cremated here. 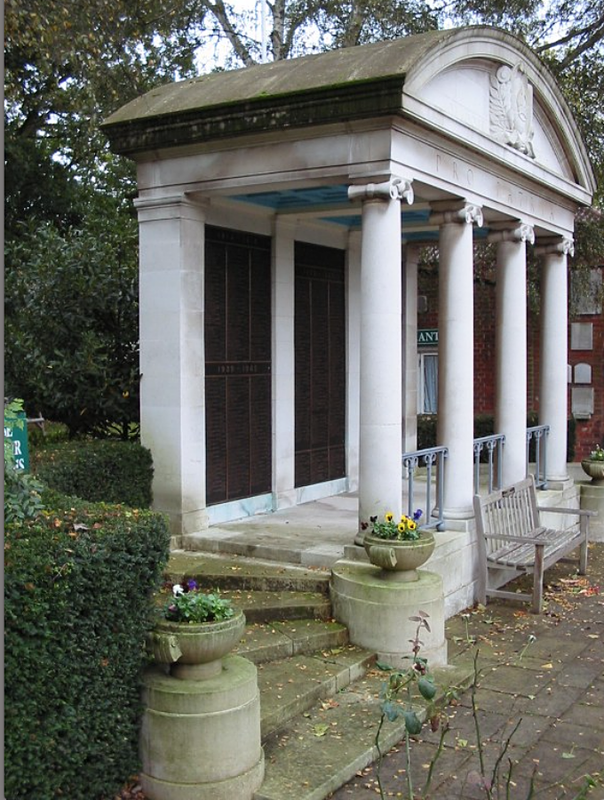 After the Second World War a site was selected and made available to the Commission, through the generosity of the London Cremation Company Limited, for the erection of a memorial to the men and women who died in the two world wars and were cremated here. 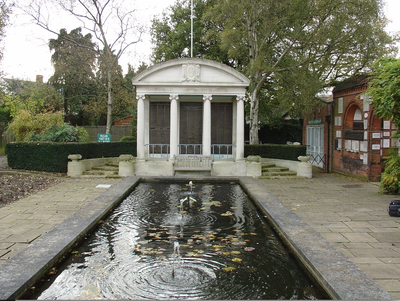 The Memorial, which is situated at the end of the long terrace in front of the memorial cloisters, immediately behind the ornamental lily pool, was designed by the Commission's Chief Architect and Artistic Adviser, Sir Edward Maufe, R.A., to harmonise with the adjacent buildings. It consists of a small Portland stone colonnade protecting and enshrining three bronze panels bearing the names. Inside the curved pediment are the dates 1914-1918 and 1939-1945, and carved on the frieze beneath are the words "PRO PATRIA". The columns are linked at the base by wrought iron balustrades, and a sea shell, representing immortality, is engraved on the capital of each column. The memorial, which was unveiled by Lord Wigram and dedicated by the Bishop of Willesden in May 1952, is approached on either side by a curved flight of steps, and is set against a background of trees. Lieutenant Colonel Thomas Colclough Watson, V. C. (Received the V. C. during the First Mohmand Campaign in India, 1987). Royal Engineers, died of illness contracted whilst serving in Mesopotamia during World War One on 15th June 1917, aged 50. Son of the late Thomas Colclough Watson, of Dovercourt, Essex; husband of Edith Watson, R.R.C., of 27, Courtfield Rd., South Kensington, London. 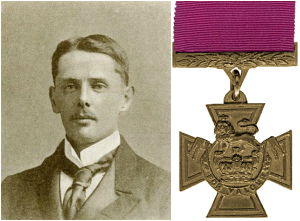 Citation; An extract taken from the London Gazette dated 20th May, 1898 records the following :- "Thomas Colclough Watson, Lieut., Royal Engineers. (Mohmand Expedition). This officer, on the 16th Sept., 1897 at the village of Bilot, in the Mamund Valley, collected a few men of the Buffs (East Kent Regt. ), and of No. 4 Company, Bengal Sappers and Miners, and led them into the dark and burning village to dislodge some of the enemy who were inflicting loss on our troops. After being wounded and driven back, he made a second attempt to clear the village, and only desisted after a second repulse and being again hit and severely wounded."